For determining the liquid limit of soil for Soil Testing - . This is specially useful to obtain reliable and accurate results of those soil which have low plasticity index. 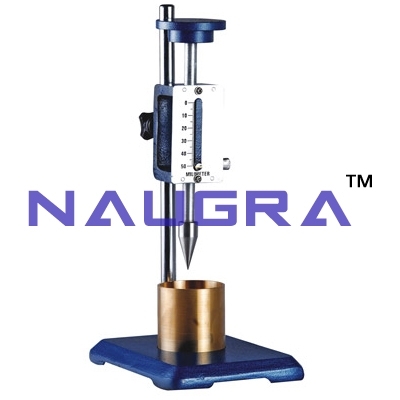 The percentage moisture contents determined when cone with half angle of 15-30 minutes under a total sliding weight of 148 gm penetrates 25mm gives the liquid limit..
We are leading manufacturers, suppliers & exporters of Soil Cone Penetrometer For Testing Lab for Soil Testing Lab. Contact us to get high quality designed Soil Cone Penetrometer For Testing Lab for Soil Testing Lab for schools, colleges, universities, research labs, laboratories and various industries. We accept bulk orders for government tenders in all countries around the globe.